Riding on the success of TVS StaR City+ TVS Motor Company today announced the launch of its ‘Special Gold Edition 2015 TVS StaR City+’ motorcycle. The launch coincides with the completion of one year of the highly successful TVS StaR City+. The variant will come with several additional new elements that enhance the superiority of the motorcycle. The most significant feature would be the first-time introduction of white and gold colour combination which complements the motorcycle’s modern styling, superior 110cc engine performance and exciting new features. We have launched the Special GoldEdition TVS StaR City+ to commemorate thecompletion of one year of the extremely successful TVS StaR City+. This variant builds on the superiority of TVS StaR City+, with Gold theme styling along with exciting new features like tubeless tyres and USB charger. It endorses our commitment to introduce exciting products for our customers through continuous product innovations.We are confident that this Special Gold Edition TVS StaR City+ will also be a huge success with our customers. said K N Radhakrishnan, President and CEO, TVS Motor Company. The new style enhancing elements that will feature on the Special Gold Edition 2015 TVS StaR City+ include a white body colour with vibrantgolden graphics,unique gold coloured mag wheels,gold coloured three dimensional brand logo, ‘Bike of the Year’ endorsement accompanying a gold coloured TVS logo on the visor, contrasting beige coloured side cover frame and a dual textured seat with red stitching, which is offset by red coloured shock absorbers. The motorcycle is also equipped with high grip tubeless tyres and a USB mobile charging provision under the seat. 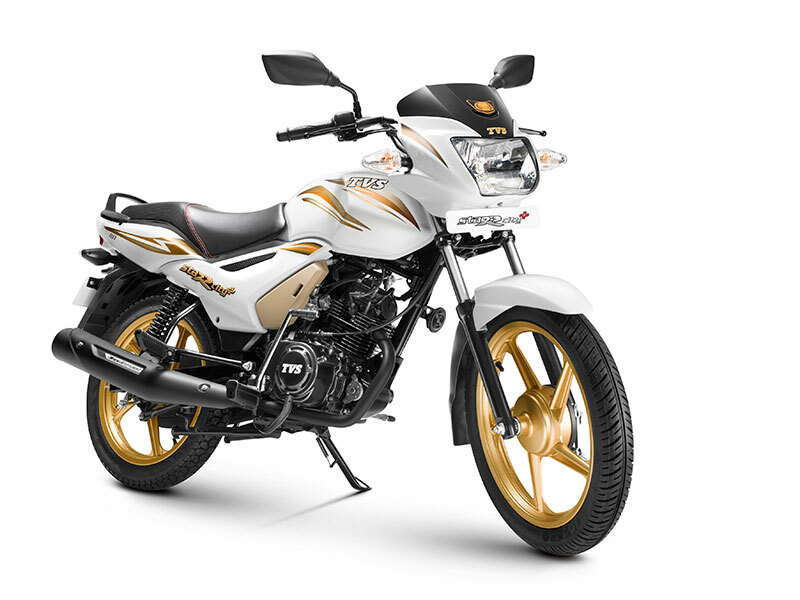 The Special Gold Edition TVS StaR City+ will come with the same tried and tested 109.7cc powermill which is an ideal combination of smooth performance, power and fuel economy. Telescopic front shock absorbers and five step adjustable rear shock absorbers ensure a comfortable ride on almost any road surface. Soft touch premium switch gear adds to the comfort of the motorcycle. The overall chiseled and muscular ‘flow motion styling’ along with new colours and styling elements give TVS StaR City+ a distinct road presence. The Special Gold Edition TVS StaR City+ is priced at Rs. 48,934/- ex-Delhi and is currently available at all TVS Showrooms across India.